The glaring sight of snow-capped mountains, frozen rivers and milky white pine and oak trees of Himalayas in winter captivates the mind and soul of travelers like anything. Beautiful Himalayan hill stations nestled between valleys and mountain passes unfold their hidden beauty with the advent of winter months. Hills of Himalayas during winter are the perfect sight to play in the snow, trek on frozen rivers, ski on powdery white snows and click pictures on the snow- carpeted meadows. Uttarakhand and Himachal in India offer shelters to some of the most exotic hill towns of the country whose myriad beauty and dazzling vistas have attracted thousands of tourists from all parts of the world. Cool temperature, freezing wind and misty hills and dropping snowflakes of Mussourie unfolds its hidden beauty during the chill winter months. The beauty of Switzerland can be found very well in India if one makes his way to Mussourie in Uttarakhand. The green alpine trees turn white, the lush meadows get covered by snowflakes, silver clouds float across the sky and at times come down to kiss the mountain peaks and a 360 degree horizontal rainbow is painted on the grayish blue sky. Wearing the heaviest of woolen garments people make their way to Mussourie to enjoy the beauty of snow- clad mountains. It is snow everywhere and one an ultimate opportunity to play with snow and soak in the elegance of nature. Cameras should be kept handy to capture some of the most romantic, serene and adventurous scenes of nature. Another heavenly destination in Uttarakhand is Ranikhet, the land of queen like meadows. Acres and acres lush green meadows full of tall pine, deodar and oak trees get completely blanketed with snow and make the whole area look like a frozen cake on a freezing land. The picture perfect winter look of Ranikhet is similar to any European destinations whose snowy mountains and frozen pastures are highlighted in Bollywood and Hollywood movies. The hills of Uttrakhand are as pretty as a postcard during the winter months. Anyone who loves to ski along with snow packed mountain bodies, then one must make his way to Auli. This small hill station perched at a height of around 3050 meters above sea level is also referred to as Asia’s best skiing destination. For some Westerners, skiing at Auli is as adventurous and beautiful as skiing is some of the best European skiing destination. During peak winter months, the roads along with oak and coniferous forests blanketed hills of the region get absolutely blanketed by snow. White becomes the color of the season and within a chilly atmosphere, this unspoiled terrain offers the perfect location for professional and amateur skiing. The most popular destination in Himachal Pradesh, Manali, is the most sought after hill station during winter. Romance, adventure and leisure come together to offer the best vistas of nature that is bestowed on the hills of Manali. Clouds float down to touch the snow packed mountain peaks and offer a misty sight of nature. Paragliding, high- altitude trekking, ice- capped river rafting and skiing are best enjoyed in Manali during the winter months. 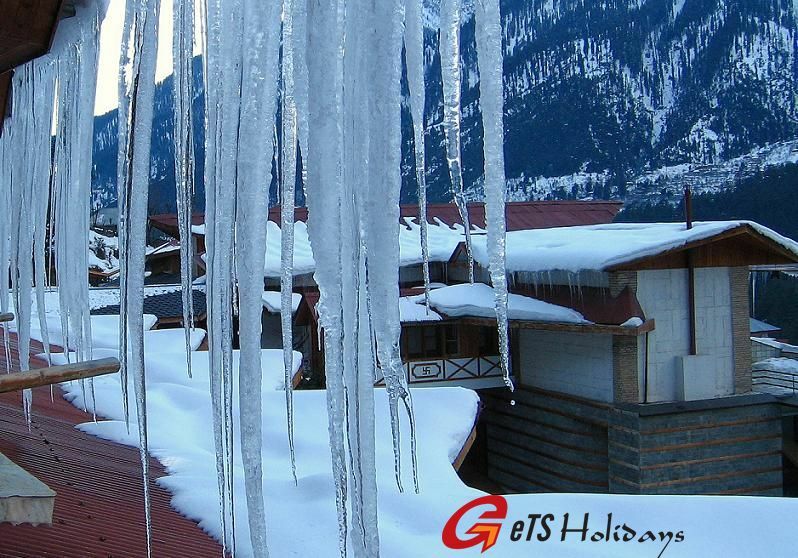 A trip to Manali in winter is the best way to enjoy the snow- draped Himachal. A bag of trekking kits, woolen garments, camera and excitement are all required to make the best of Himalayan holidays in India during winters.